Here at ChiIL Mama's home office, items come and go for reviews, giveaways, and reference, at an astonishing pace. I'm also an artist, with a crazy array of art supplies. I've always had issues staying organized, and having 2 children and their accompanying stuff makes thing worse. 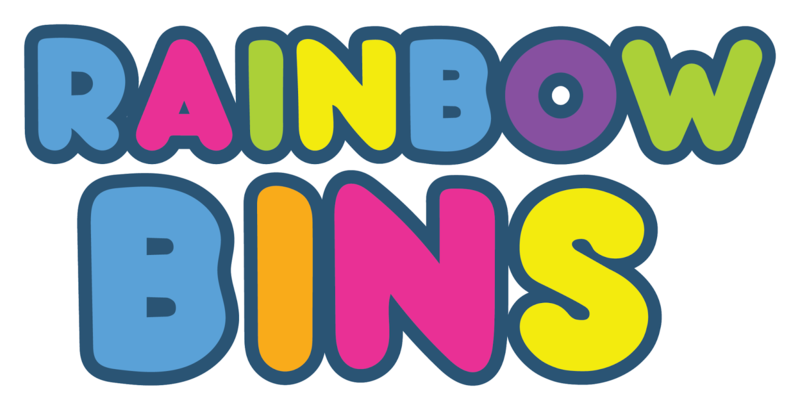 So I was happy to hear about the new launch of Rainbow Bins and delighted when they wanted to partner up with us. You can order on Amazon and receive your set of 6 colorful Rainbow Bins in the mail, so it couldn't be easier. We're always on the lookout for items to organize our work and play space. These are BPA free, super kid & pet friendly, won't shatter when dropped, and they're stackable! We have a zillion cheap bins around with missing handles or jagged edges that either my big dogs or my kids have managed to break. I'm excited that Rainbow Bins have built in handles with rounded edges, and they are both strong and flexible, so broken bins won't be an issue. We're all about smart, safe, storage solutions. 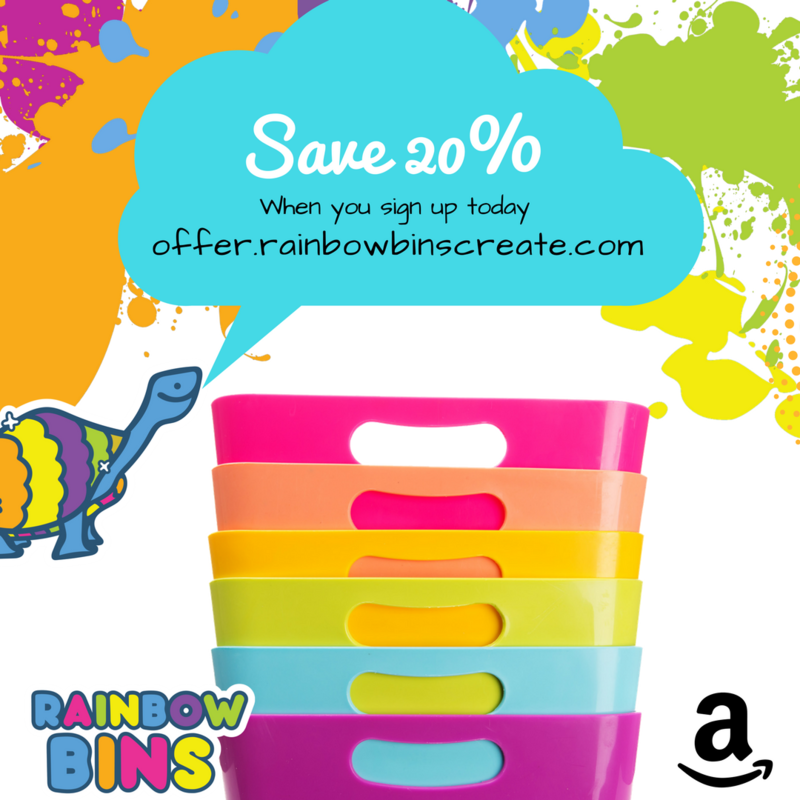 Sign up on the Rainbow Bins page offer.rainbowbinscreate.com to receive the latest deals, offers, and opportunities for creative idea exchange. We are an organizational supply company whose mission is to build the best products that inspire creativity and exploration. 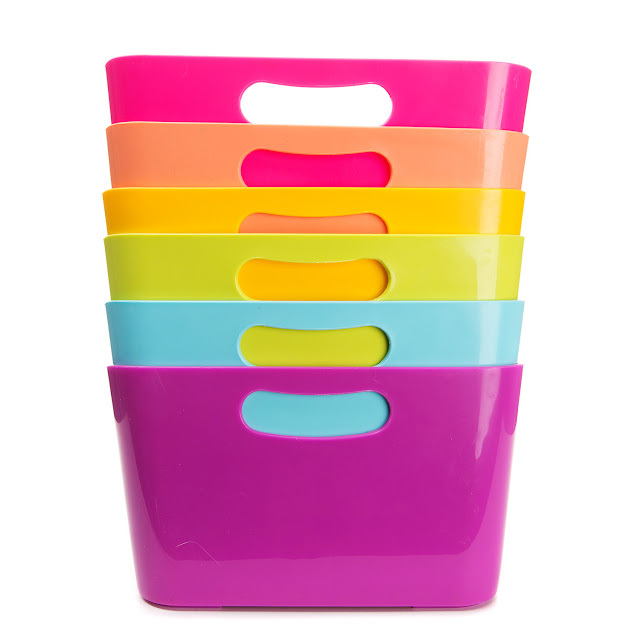 Our colorful, flexible, and stackable bins are the perfect tool to help organize classroom supplies, paper, art supplies, and more. Rainbow Bins are also super kid-friendly - crack and shatter resistant. Each set of Rainbow Bins comes with 6 colorful bins and fun collectible stickers. Whether it's storing papers for their next novel, holding paint brushes for a new Picasso, or cradling the toys they hold near and dear to their heart, Rainbow Bins are the vessel to empower their childlike wonder. THE PERFECT, VERSATILE ORGANIZATION TOOL: Use them as art bins, for DIY projects, craft storage, sewing, scrapbooking, as a book box, on your art desk, next to your easel, to hold your art sets, in your closet, cubby, for your office storage, or as storage baskets for shelves. DESIGNED WITH YOU IN MIND: Flexible material does not crack or break. Heavy duty, durable, and drop proof. Constructed from toxic-free polypropylene (PP for short). BPA free. Easy to clean, easy to wipe down. Designed with sturdy ergonomic handles that are free from sharp edges. Easy gripping for adults and children alike, making it easy to move your Rainbow Bins from room to room! These bins can drop, roll, tumble, and fall and not a leave a dent on themselves (or your floor)! STACK TO SAVE ON SPACE - Rainbow Bins can be used to store children’s toys, games, books, magazines, files, snacks, pet supplies, laundry supplies and more! When they’re not in use, Rainbow Bins are designed to stack on one another. OPTIMAL CAPACITY - Many craft and storage bins are small. Rainbow Bins are BIGGER bins and allow you to store more. They are perfectly sized for holding letter paper. Store your art paper with your art brushes. Store your entire project in one bin! Accommodates 8.5" x 11" sized paper and activity pads. A FAMILY OWNED BRAND, WE KNOW KID-FRIENDLY AND PET-FRIENDLY - Bright colors help you organize by activity. Make cleanup a breeze with unique organizational style. Rainbow Bins can be used stand alone or fit into most cubby units ands shelves. Rainbow Bins support more weight and hold heavier items than competitive storage brands. Each set comes with 6 colorful bins and a set of collectible fun stickers. 100% Satisfaction Guaranteed! Disclosure: I have been compensated for sharing this product launch with our readers. As always all opinions are my own.